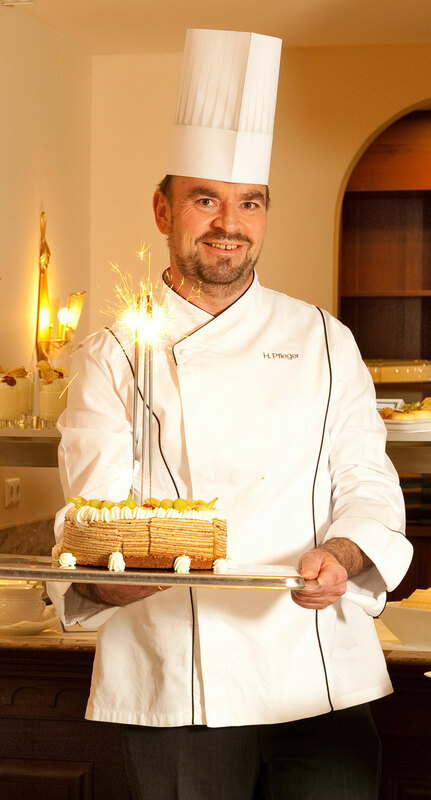 Hotel Bismarck head chef Harald Pfleger has been responsible for the top quality and excellent reputation of our kitchen since 1999. His constant motivation for further training takes our cuisine to new heights. All dishes are freshly prepared. You won’t find flavour enhancers in our kitchen, nor do we use convenience food. After completing training at the Hotel Weisses Rössl at Lake Wolfgangsee, his career took him to France and then back to Austria, where he worked in leading positions in many renowned establishments such as Erlhof in Zell am See, Kobenzl in Salzburg, Goldener Hirsch in Salzburg and Hotel Hochgurgl in the Ötztal Valley. Never happy to stand still, his regular training courses with chefs such as Otto Koch, Heinz Winkler and Andreas Döllerer, to name a few, have brought the quality of his creations to the highest level. Mr Pfleger looks forward to receiving your application.